My Little Man was two weeks old when he first attended a baseball game his dad was coaching. In the two years since that time, baseball has become an even greater part of our life, and our son has attended so many games we have lost count. While we wouldn’t trade this life for anything, it does come with its own set of challenges – one being navigating season and game-days with a little one in tow. With all its challenges, I’m here to tell you it can be done! You CAN survive the season with an under-two-year-old. Here are some of my best tips for surviving the season with a baby or toddler. My ring sling was a complete life saver! I wore my son in it for the majority of the time at each game throughout his first year. It kept him content, freed my arms up, and made it less likely for random people at games to get overly friendly. Ring slings are my favorite, because they are simple to learn, comfortable, and they grow with the child (can be used infant – toddler). If that’s not your thing though, I’d recommend going with a lightweight baby carrier, whatever type you choose. Don’t feel like you can’t miss a game. Guilt about missing a game is a real thing. I get it. I hate missing a game too. Being a coaching family is our life, and I feel like I am not supporting my coach if I miss a game. Here’s the thing though, sometimes it’s just too much. Some days, you might be completely exhausted from still trying to get the hang of having an infant, or your 7-month-old might be teething, or your toddler might have been throwing tantrums all day, and even just the thought of getting to the game is too much. Guess what? That is okay. Be honest with your coach about this, and learn the other ways you can support him – even when you are not able to be present at a game. Bring hats and changes of clothing. Floppy hats or ball caps for the summer and knit hats for cold weather sports are essentials. Also, make sure to have at least one change of clothing (especially for the first year) because baby diaper blowouts are inevitable. Always have the stroller with you. “Mom brain” happens. Rather than trying to remember all of the things I am supposed to bring with me to a game, and put them in the car every time, I have learned that I am less likely to forget stuff if I leave the core items stashed in my trunk. A stroller is one of those items. Keep it with you at all times. You will not regret it. Okay, this may seem silly, but if you’re like me, you likely don’t carry much cash and sometimes you forget to bring your own snacks to the game. Try to make it a habit during season to always have at least a few bucks on you, just in case you bottom out and realize you didn’t bring the snack bag (or you just happen to be craving a hot dog). I call it my “hot dog money,” and making sure to always have it with me has saved me many nights. As moms, it can be so easy to go full-steam ahead, and be hesitant to ask for help. Ladies, this isn’t healthy! Yes, your husband is busy during season, but be honest with him when you are overwhelmed. Even if he cannot always physically help, he can help you sort through what you are feeling and create a plan of action. If other coaches’ wives, friends, or family volunteer to help, don’t hesitate. Even if it’s just watching the kids while you go to the grocery store alone, that could be the exact thing you need to keep your sanity. Look for a baby-wearing/car seat cover if you live in a cooler climate. If you haven’t heard of baby-wearing covers, head over to Google and take a look! A longtime friend kindly gave me hers when I had Little Man. It has a soft, thick interior to keep baby warm, and a waterproof/windproof exterior. It is made to tuck up under their legs when they’re being worn, and then ties to the carrier or behind your neck. The one I have doubles as a car seat cover…which is wonderful too! Seriously, this is one of the greatest inventions ever, and so perfect for a coach’s wife, especially if it can get nippy during your season. Find a good picnic blanket. This is helpful once your little one has become more active. It gives you both a clean, dry place to sit, allows them to play, and you can set it up where you can still see the game. This past season and summer ball season, I made the picnic blanket our game day station. More often than not, we were up running and playing, but it still gave us a good place to come back to for breaks and snacks. This is an adorable football muslin blanket that would be perfect. If your sport is in the summer, invest in a tent or canopy. This summer ball season, after one too many scorching hot games, we finally decided to invest in a tent. If your season is in summer, it is worth it. There are all kinds of tents on the market. We chose to go with a simple pop up tent. This gave me and Little Man a shaded spot to rest and play. It made life better. Find other coaches’ wives to lean into for support. At my husband’s first coaching gig, out of 5 coaches (all married), I was the only wife to come to games. The one time I met the head coach’s wife, all she did was give me unsolicited parenting advice. Obviously, it was not a tightly knit group, and as a wife, I had no support system. When we moved to our current location, everything changed. The head coach’s wife is the team mom, and is a fun, encouraging, integral part of the team. The coaching staff is close-knit. 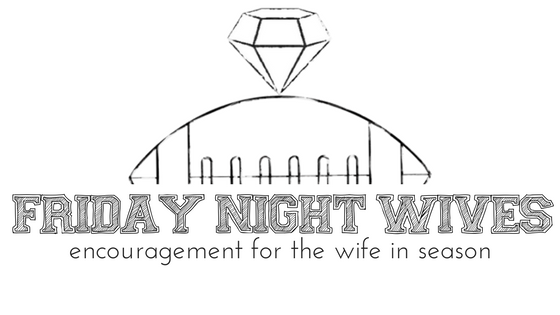 On top of that, I’ve found amazing networks, such as Friday Night Wives, for connecting with coaches’ wives across the country. Never underestimate the importance of having a support network that understands your lifestyle. It’s hard sometimes, but it can be found. Season isn’t just hard for you. Chances are, your husband is also exhausted, stressed, and has moments where he is just trying to survive. Show him grace. Be honest with him, support him, encourage him, love him. If he messes up, forgive him and move on. This is showing grace, and it is so important. Your whole family will be happier during the season if showing grace is made a priority. Stop being so hard on yourself! Know that everything will not be perfect. If the house gets messy or you eat out more than you want, that’s okay. It won’t always be smooth moving, but this is the life of a coach’s family. It ebbs and flows with ups and downs, and you learn to ride with it. The good in it all can outweigh the hard, it’s just a matter of grace and perspective. 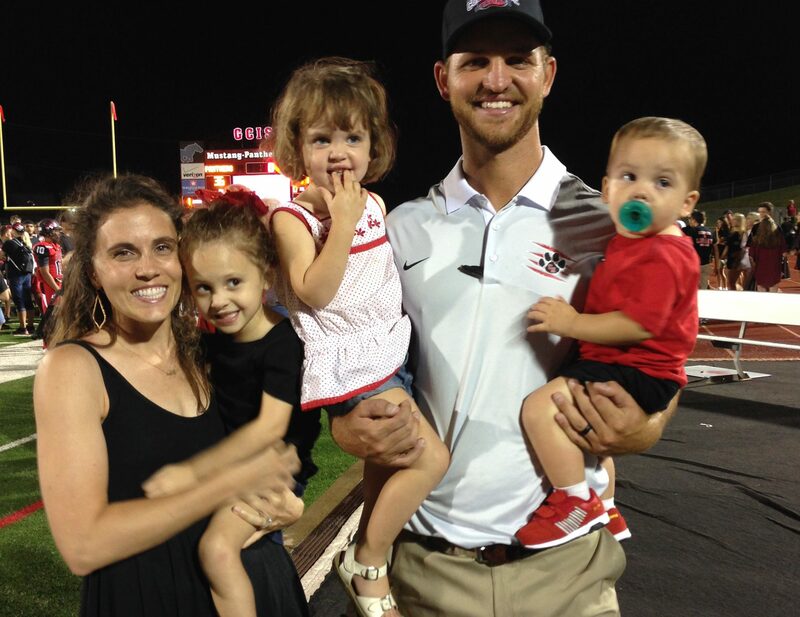 Hannah Burney is a baseball coach’s wife and mom to an increasingly baseball obsessed toddler son. She is currently located in the Greater Cincinnati area. She is thankful for the opportunity to be a stay-at-home mom, and has been working hard to establish herself as a creative freelancer and writer. In her spare time (you know, when not cleaning up messes or watching baseball games), she enjoys hiking, exploring local shops and restaurants, playing piano, reading and cooking. You can follow her life, loves and adventures on Instagram @frecklesandredheads and via her blog hannahwarren1.wixsite.com/frecklesandredheads.